Larsens truck sales is the dream of founder David Larsen. For over 30 years David has built his reputation in Australia’s transport and used truck industry. From driving trucks, to owning trucks, and also having started it all as a diesel mechanic for Detroit Diesel, David feels he can relate to many different parts of the transport industry. 2014 was the first year for Larsen’s trucks, and is now on the rise to become one of Australia’s biggest and best Used truck dealerships! With a growing team of genuine and educated staff, buying a truck has never been so easy, and enjoyable. Our prominent corner yard features a huge range of used trucks from prime movers, to car license tippers, Kenworth to isuzu. We also understand that many customers will require a particular specification of truck to suit their work, which is why we pride ourselves in building and modifying, to ensure you get the perfect truck! Whether you are looking to buy a truck, sell a truck or even a valuation on your fleet, with David and his team you will be in great hands. So come down and check out our state of the art showroom filled with cars, bikes, and even a bar to sit down and have a drink. Custom Trucks is also something we enjoy doing at Larsens trucks, whether its for a customer, or for an upcoming show. We get to a few different shows every year and like to display what we have built! All trucks are for sale during and after shows. 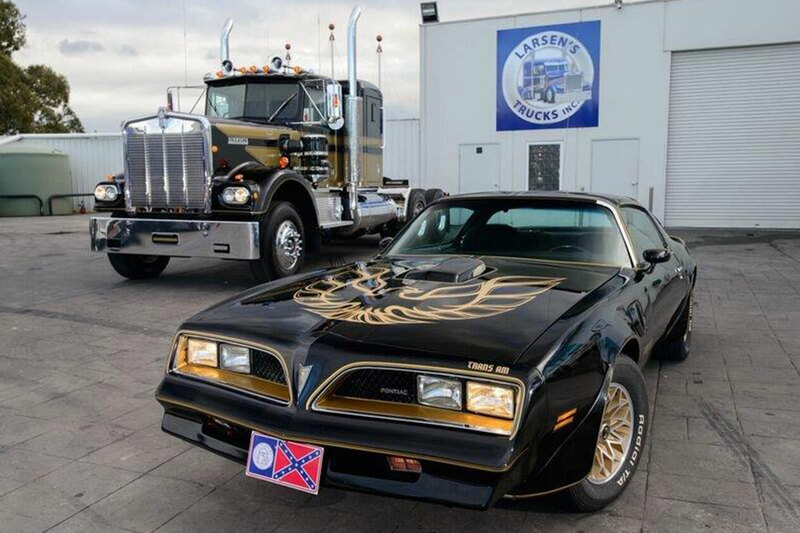 If you are into trucks then I am sure you have seen the “Smokey and the Bandit” films starring Burt Reynolds. The below duo is the latest to come out of our shed. The truck is a 1976 Kenworth W900 and is an exact replica of the Snowmans truck (played by Jerry Reed) It just doesn’t get any more Iconic than this!